My ‘18 bike has the BMW Alarm system, that auto activates a short while after the ignition is turned off. Is there a knack to refuelling without making an exhibition of yourself, or having to open the filler then immediately take the key out and turn on the ignition again until you’re done? are you sitting on your bike when refuelling it? 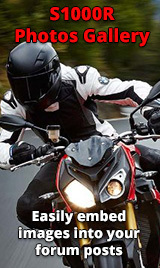 I hate alarms but my bike came with the BMW alarm fitted, no one takes any notice of them anyway so I had BMW switch it off pre-delivery , the instructions are in the handbook it appears, id just switch it off permanently mate.